Dr. Caplan has also written a brief synopsis of the Diagnosisgate article here. The central theme of Dr. Caplan’s 2015 article is that in 1995, Allen Frances, MD, and two other psychiatrists (John Docherty and David Kahn) received grants of about $515,000 from Johnson & Johnson to write “Schizophrenia Practice Guidelines” which specifically promoted Risperdal (a Johnson & Johnson product) as the first line of treatment for schizophrenia. The guidelines were called the “Tri-University Guidelines” in recognition of the fact that Dr. Frances worked at Duke, Dr. Docherty at Cornell; and Dr. Kahn at Columbia. Subsequently, the three psychiatrists formed Expert Knowledge Systems, and from that platform, actively assisted Johnson & Johnson in the implementation and marketing of the guidelines. For these latter services, J & J paid EKS a further $427,659. The role of the three psychiatrists came to light because in 2004, the State of Texas filed a lawsuit against Janssen Pharmaceutica, a subsidiary of Johnson & Johnson, alleging that company officials “targeted Texas Medicaid with their sophisticated and fraudulent marketing scheme” (here) to ensure that Risperdal was included in the state’s preferred drug list. During these proceedings, an expert witness report was presented to the court by David Rothman, PhD, professor of Social Medicine at Columbia University College of Physicians and Surgeons. The report is titled simply “Expert Witness Report” and is dated October 15, 2010. The report, which can be found here, runs to 86 pages, and is meticulously detailed. The production of the practice guidelines involved polling a selected sample of expert psychiatrists, and collating their questionnaire responses. What’s particularly noteworthy in all of this is that since about 2010, Dr. Frances has been critiquing the obviously expansionist agenda of DSM-5, and the corruptive role of pharma in disease-mongering, and in the increasing over-use of psychiatric drugs. In this context, he presents himself as the defender of moderation and scientific integrity, but, to the best of my knowledge, he has never publicly acknowledged his marketing role with J & J in the creation of the Tri-University Guidelines. On March 5, 2015, Dr. Frances did respond to Paula Caplan’s “Diagnosisgate” article. Here are some quotes from this response, which appeared on the Huffington Post blog. The quotes are interspersed with my comments. It is my general perception that when people respond to criticism with this kind of personal attack, they have something to hide. There is no suggestion in Dr. Caplan’s article that Dr. Frances’s participation in the guideline development was a conflict of interest with DSM-IV. In fact, Dr. Caplan notes that J & J’s first payment to Drs. Frances, Docherty, and Kahn occurred the year after DSM-IV was published. What’s stressed in both Paula Caplan’s and David Rothman’s reports is the fact that Dr. Frances and his two co-founders of EKS actively collaborated with Johnson & Johnson in the marketing of Risperdal, and that the guidelines that they created were clearly designed for this purpose. There is no reference, or even implication, in Dr. Caplan’s article, that Dr. Frances made a great deal of money from DSM-IV sales. Dr. Caplan mentions the fact that sales of the manual “earned more then $100 million”, but there is no suggestion that Dr. Frances shared in these profits. Again, what’s stressed in both Paula Caplan’s and David Rothman’s articles is that Dr. Frances and his colleagues made about $900,000 from J & J for producing and marketing the Tri-University Guidelines. From this – obviously very large group – Dr. Frances and his partners selected 99 psychiatrists, 87 of whom responded to the questionnaire. I can find no information as to how the 99 psychiatrists were selected. So, there was absolutely nothing wrong with the guidelines, but the acceptance of pharma money may have created an appearance of bias. And although no such bias existed, Dr. Frances is apologizing for creating this appearance. But remember the EKS commitment quoted earlier: “We are also committed to helping Janssen succeed in its effort to increase its market share and visibility in the payor, provider, and consumer communities.” This is a clear statement of bias. It’s not an appearance of bias; it’s not possible bias. It is out and out, unmitigated bias. They express commitment, not to some improvement in client outcomes or welfare, but to increasing Janssen’s market share. Drs. Frances, Docherty, and Kahn were hired to market Risperdal. They were well paid, and they delivered what their employer expected of them. So, he assumed without evidence that the drug was safe unless proven dangerous, when in fact, good practice would be the opposite: assume that the drug is dangerous, until it’s proven safe! But, in any event, it wasn’t Dr. Frances’s fault. After all, who could have known? So Dr. Gelenberg could see these issues very clearly in 1996, when the guidelines were published; but Dr. Frances, despite his mea culpa in the Huffington Post last March, still hasn’t grasped the issue. In that document, from which I quoted earlier, Dr. Frances contends that the guidelines “…contained built in methodological protections against industry-favorable bias…”. But as Dr. Gelenberg so clearly points out, the expert consultants on whose opinions the guidelines were based were already subject to industry influence by the very fact of their status within the psychiatric community. So, in fact, industry-favorable bias was actually built in. Page 2 of the supplement lists the 87 expert psychiatrists on whose questionnaire responses the guidelines were based. The list is in alphabetical order, and I checked the first fifteen names for links to pharma. Two of the fifteen are deceased. Of the remaining thirteen, nine have disclosed that they have received payments from pharmaceutical companies, and eight of these have received payments from Janssen Pharmaceutica/J & J.
I have no way of checking if these financial links were present in 1995/96 when the guidelines were produced, but the extent of these individuals’ involvement with pharma today suggest that Dr. Gelenberg’s concerns were probably well founded. The term “unrestricted” has a very specific meaning in this context. It means that the recipients of the grant are not required to produce any particular result. Essentially there is an expectation that both grantor and recipient will take steps to keep one another at arms’ length. The term “unrestricted” is, in a sense, a warranty to the reader that the document in question is free from funder bias. In the light of the material quoted above, it strikes me that the description “unrestricted” in this case was at best misleading, and possibly a blatant deception. Are the allegations against him and his EKS partners that are set out in detail in the David Rothman report accurate? Are the quotations in that report that are attributed to Dr. Frances accurate? If the answer to both of these questions is No, then I suggest that Dr. Frances start devoting his time and energy to addressing these matters, and clearing his name, because the allegations are very serious. But if the answer to one or both of these questions is Yes, then I respectfully suggest that Dr. Frances exit the stage with whatever dignity he can muster, and resume his well-earned retirement. Mickey Nardo, MD, has also posted David Rothman’s report on his website, 1 Boring Old Man. Dr. Nardo has also written a post on this topic. The post is titled detestable. I have quoted from David Rothman’s report in this post, but I’ve confined my attention to material concerning Dr. Frances and EKS. In fact, the report covers a lot more ground, and gives a great deal of detail on the pharma-psychiatry corruption that has marred the landscape in this field for so long. It’s well worth reading. Such a sense of civic responsibility! Robert Whitaker discusses EKS and the Tri-University Guidelines in his latest book, Psychiatry Under the Influence, p 149-150. And for anyone who has any doubts concerning the effectiveness of pharma-psychiatry’s marketing machine, here’s a graph produced by the Agency for Healthcare Research and Quality (AHRQ), a division of the US Department of Health and Human Services. 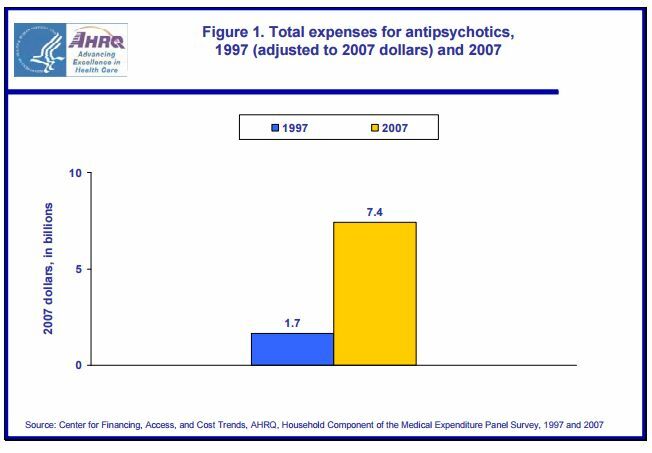 So between 1997 and 2007, total expenses for neuroleptic drugs in the US went from $1.7 billion (corrected to 2007 value) to $7.4 billion. This is an increase of $5.7 billion over and above any increase due to inflation. The cost of these extra sales in terms of reduced life expectancy and quality of life is psychiatry’s legacy to humanity. I am a licensed psychologist, presently retired. I have worked in clinical and managerial positions in the mental health, corrections, and addictions fields in the United States and England. My wife Nancy and I have been married since 1970 and have four grown children.